This Voter Registration Maps series post shows the county-by-county trend in voter registration since last January. 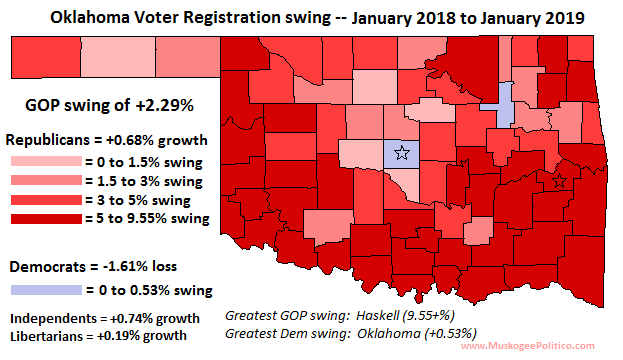 Registration swung toward the Republican Party in 75 counties, with the only exceptions being Tulsa and Oklahoma counties. Haskell County had the largest swing, posting a shift to the GOP of 9.55%. Oklahoma County slid 0.53% toward the Democrats, and Tulsa County shifted 0.23% toward the Democrats.